Sometimes the world has to be put on hold and we need to focus on ourselves. Five minutes is all it takes, but it is a moment in time when thoughts crystalise, decisions are made and courage is suddenly found to put them in place. Or it could be a moment of relaxation, when in the midst of a stressful life, you stop for a while to reclaim some sanity and to reassure yourself. I used to enjoy many such little detours when it was all about me. Little rituals like having a quick coffee on my own or spending a whole day with a favourite book were an intrinsic part of my single life. I never questioned the need to dedicate time to myself. I did it and it felt good to reconnect with my inner self. Family life obliterated this need. Instead of constantly searching for my inner voice, I started to enjoy finding solutions to daily obstacles first as a part of a couple and then as a mother. It was all about the teamwork. It was not all about me anymore. Having coffee on my own became a thing of the past. Anyway, it was a habit I had picked as a 19-year old when I spent two months in Northern Portugal interning at a local radio station. When I arrived I didn’t know a single soul in town and I had two options – I either had to stay at my rented home in my free time or make the effort to go out, get to know the place and try to enjoy my time there, albeit all by myself. Being an ever curious soul, I chose the latter and after the initial embarrassment of taking coffee on my own, I realised that this in principle most social activity is in fact perfect to do on your own, as it not only gives you a chance to indulge in a spot of people watching, but provides you with time to get to know yourself, to listen to your own thoughts and follow the unknown roads they will take you on. So coffee for one became my thing and I kept it through the years to come both in Bulgaria where I am from and in England where I lived for a while. At every new place I would travel solo to I would repeat my little ritual and feel not only refreshed by the caffeine but also refuelled with life. And then I stopped drinking coffee altogether. I read in a book that caffeine affects fertility and as I was having some issues in this respect at the time, it was an easy decision to make. I started drinking tea but it was never quite the same. Then I threw myself head first into family life and spending time with myself lost its appeal. It was so much more fun spending time first with my husband and then with my baby and discovering the world together with them. My Italian Monday mornings are for running errands. I walk all over town aiming to do things which in England would have taken me a phone call, but in Italy seem to take a personal visit to the respective organisation or shop. Like paying our telephone bill, which became a whole saga, but when you move to a new country to live, there is a steep learning curve and it seems some things are organised differently in Italy than elsewhere in the world. Anyway, it was Monday morning and I was on my errand-running track. Halfway through I just needed to put the world on hold and re-focus on myself. A decision was made – I was going to indulge in an old habit and have a coffee for one. Finding a place to have coffee in Italy is never a difficult task. Also, Italians do coffee in a such a beautiful way. Forget the large mugs of multinational coffee chains. Forget the taste of burnt coffee beans. Don’t even think of large slices of dry cake in plates big enough to have dinner in. No, proper Italian coffee is just so. The espresso is elegantly served in a tiny cup the size of a fairy’s thimble. With a flavour so intense that even the decaf version gives you a veritable kick. 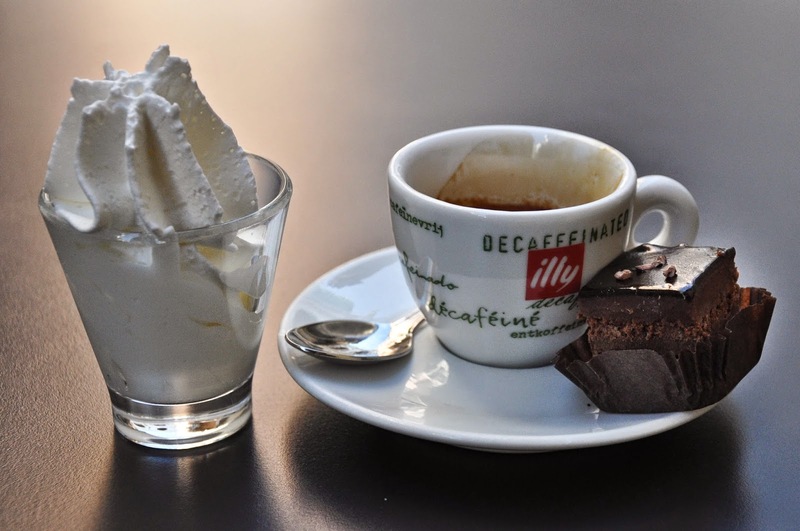 The whipped cream beautifully swirled into a small glass, so that you can scoop as little or as much as you like and slowly blend it with your coffee. And, lastly, the bite-sized cake. Rich and tasty, just the right amount to give you a bit of a sugar rush and to offset the strong flavour of the espresso. My five minutes off drew to an end. The world around me slowly came back to life. I felt ready to join it again.